Peanut butter is one type of jam that favored by the people. The raw materials of peanut butter such as peanut has a high enough consumption rates but this consumption is not always followed by its productivity. The alternative ingredients in the process of peanut butter production can be substituted by jack bean cause it has lower economic value and good nutrition, but its utilization is still limited. The Utilization of jack bean into a jam requires an additional ingredients to improve its physical, organoleptic and chemical characteristics. Therefore, the additional ingredients that can be used in the production process of jack bean butter is a full cream milk. The purpose of this research is to know the effect of the addition of full cream milk and the amount of its addition to get a good physical, chemical and organoleptic characteristics of jack bean butter.The addition of full cream milk as much as 5%, 7.5%, 10%, 12.5%, and 15% of the total water mix and jack bean flour. The results showed that the addition of full cream milk increased the spreadability of jack bean butter, but not affected the lightness. The addition of full cream milk could increase the value of fat, protein and ash content, however this addition reduced water and carbohydrate content. It was improved the acceptance of organoleptic. Addition 12.5% full cream milk was the best treatment with the lightness 70.72; spreadability 15.90 cm; water content 33.12%; fat content 25.08%; protein content 22.14%; ash content of 0.81%; carbohydrate 18.85%; the preferences of color, flavor, taste, spreadability and overall respectively 4.92; 4.64; 5.08; 5; 5.04 (rather like to likes). NAFI', Ahmad; MAQDIZ, Carolina Hendra Puspita; MARYANTO, M.. KARAKTERISASI SELAI OLES KORO PEDANG (Canavalia ensiformis L.) DENGAN VARIASI PENAMBAHAN SUSU FULL KRIM. JURNAL AGROTEKNOLOGI, [S.l. ], v. 12, n. 02, p. 126-137, dec. 2018. ISSN 2502-4906. 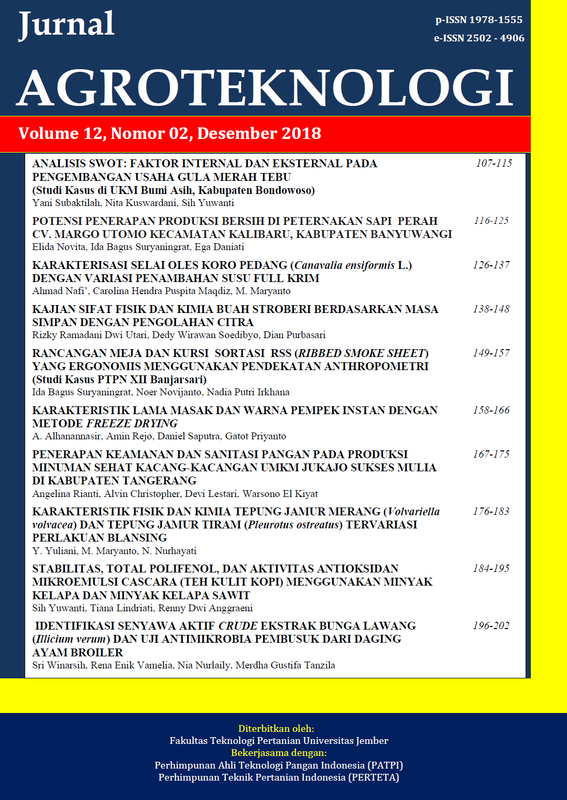 Available at: <https://jurnal.unej.ac.id/index.php/JAGT/article/view/9278>. Date accessed: 23 apr. 2019. doi: https://doi.org/10.19184/j-agt.v12i02.9278.